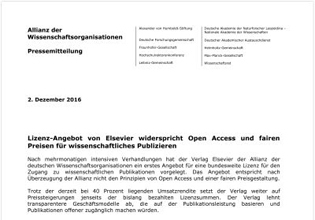 After several months of intensive negotiations, the publishing house Elsevier has submitted to the alliance of German scientific organizations a first offer for a nationwide license for access to scientific publications.According to Allianz, the offer does not comply with the principles of open access and fair pricing. In spite of the current revenue rate of 40 percent, the publisher continues to rely on price increases beyond the hitherto paid license sums. The publisher rejects more transparent business models, which are based on the publication performance and make publications more accessible. The alliance of the German scientific organizations rejects the offer of Elsevier. It calls on the publisher to submit a transparent and sustainable offer and resume the negotiations. It is the scientists who, with their mostly free work, contribute decisively to the reputation of the publishing house. This fact should also be taken into account in the business relations. The negotiations were organized as part of the "DEAL - nationwide licensing of offers of large scientific publishers" project, which was initiated by the alliance of the German scientific organizations on the initiative of the HRK. The negotiations with Elsevier for a Germany-wide license agreement are conducted under the direction of Prof. Dr. Horst Hippler, the President of the Hochschulrektorenkonferenz (HRK). The aim is to conclude a contract with a term from 1 January 2017. Springer Nature and Wiley publishes exploratory talks in January 2017; The business models should also be used as references for other publishers. The alliance of the scientific organizations is a federation of the most important scientific and research organizations in Germany. It regularly comments on questions of science policy, research funding and the structural development of the German science system. Members of the alliance are the Alexander von Humboldt Foundation, the German Academic Exchange Service, the German Research Foundation, the Fraunhofer Society, the Helmholtz Association of German Research Centers, the University Rectors' Conference, the Leibniz Association, the Max Planck Society, the National Academy The Sciences Leopoldina and the Science Council.For the year 2016 the Leopoldina took the lead in the alliance.